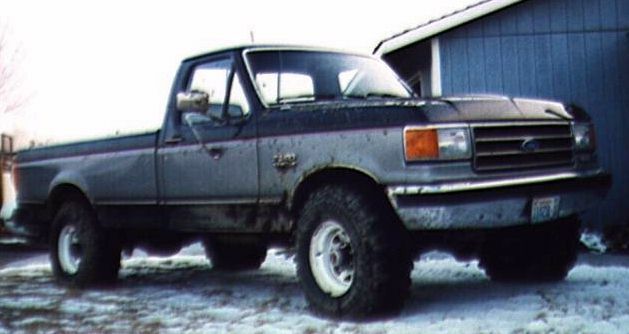 This is my F250 4X4. It is a 1991 with a 7.5L (460CID) EFI engine, 4.10 gears, and the E4OD automatic trans. It is shown below with a borrowed set of 36"x12.50" Super Swampers. The suspension is stock. I have only done minor mods to the truck so far. I ported the intake near the head end of the port to help make up for the sharp bend there. I set the fuel pressure to 42psi, installed a K&N, removed air intake silencers, and added a Rancho exhaust with straight through mufflers. I modified the catalyst outlet from a 2.5" to a 4", then to a pair of 2.5". I pull a 23' steel gooseneck horse trailer with it that weighs about 13,000lbs loaded. The trailer has living quarters with AC and a large refrigerator. When I lived in Washington, I could pull the trailer over the mountain passes and never drop below 55mph.